New Free Spirit Publishing Post: Beyond Anger Management: What's Behind the Mask? I have a new post on Free Spirit Publishing's Blog! In my latest post Beyond Anger Management: What's Behind the Mask? 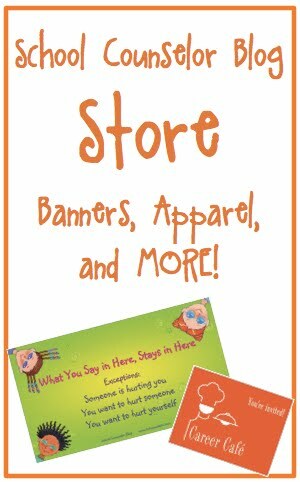 for Free Spirit Publishing's Blog, I share tips and ideas of how to help students express emotions that are behind their anger. 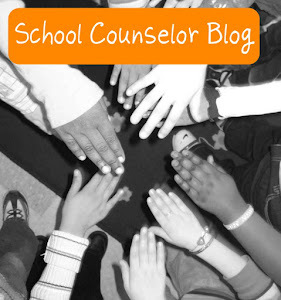 What activities do you facilitate to help students cope with anger? You can also check out my other posts about anger here. 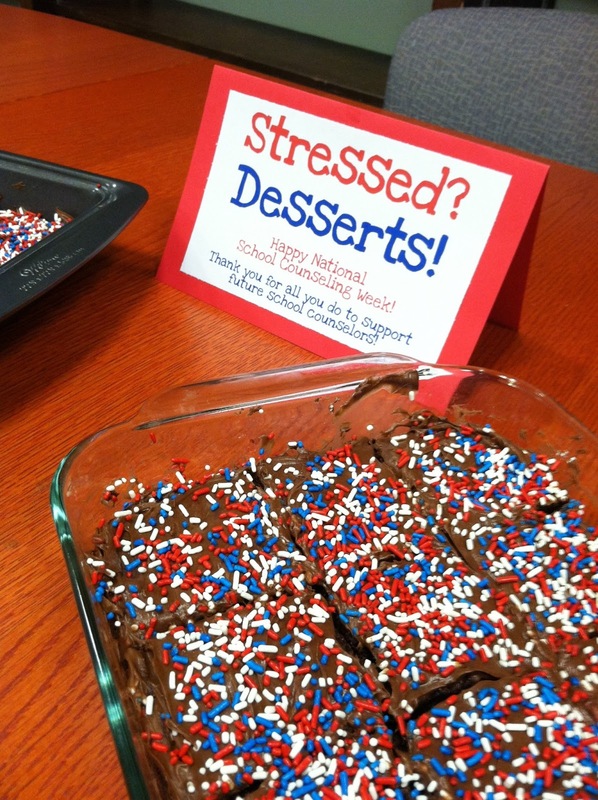 During National School Counseling Week I wanted to give a fun little treat to my school counseling internship supervision group. I had been thinking of things for weeks but was having a very hard time coming up with anything that met all of my criteria: cute, colorful, inexpensive, and able to be easily recreated (I was thinking of you all on this one!!!). While checking out my Instagram feed at the beginning National School Counseling Week I found my inspiration! Someone made a M&Ms (Magnificent and Marvelous) sign for staff with a bowl of fun-sized M&Ms I thought this was a a super cute idea that I could easily adapt for my group. I rushed to the grocery store to pick up fun-sized M&Ms so I could get to work making a printable! 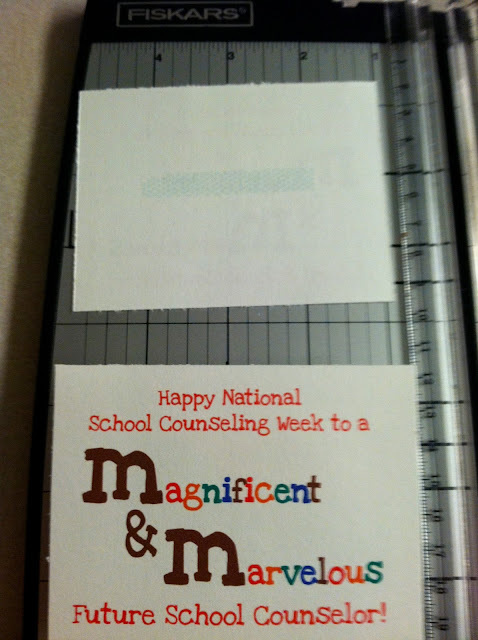 In this post I provide printable versions of the M&M message for NSCW and other times throughout the year! For the message I used a free font called Love Ya Like A Sister. I made the message more colorful by alternating a color pattern for the letters in Magnificent and Marvelous. After making the slide in PowerPoint, I duplicated it so there were six slides. I made the print layout of the document six slides to one sheet. I then printed the message on white cardstock. Using six slides to a sheet a great fit for my fun-sized M&Ms. I used red cardstock to create a border. I gluded the message on to the red cardstock with Scotch glue dots. I then used Scotch glue dots again to affix the fun-sized M&Ms to the back of the card. 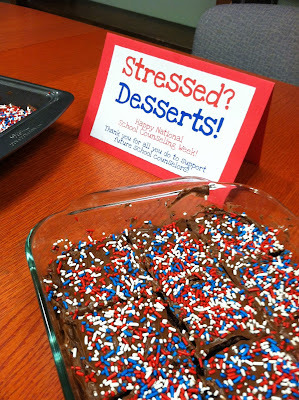 This was a simple, fun, easy, and sweet treat to make for my school counseling internship supervision group. 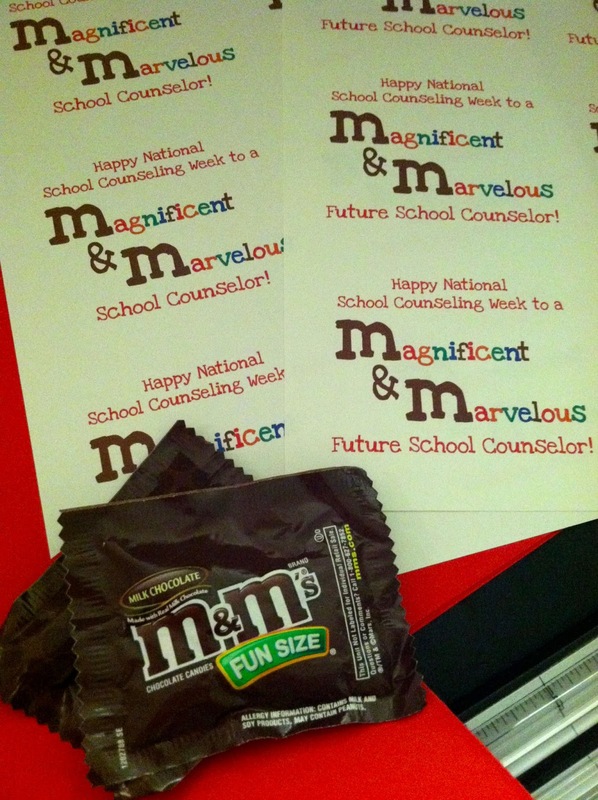 They were excited to be recognized during National School Counseling Week... and sure the chocolate didn't hurt either! 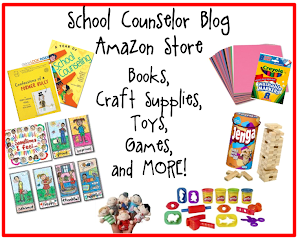 I thought this would be a great thing for you to recreate for interns or students who will be future school counselors. 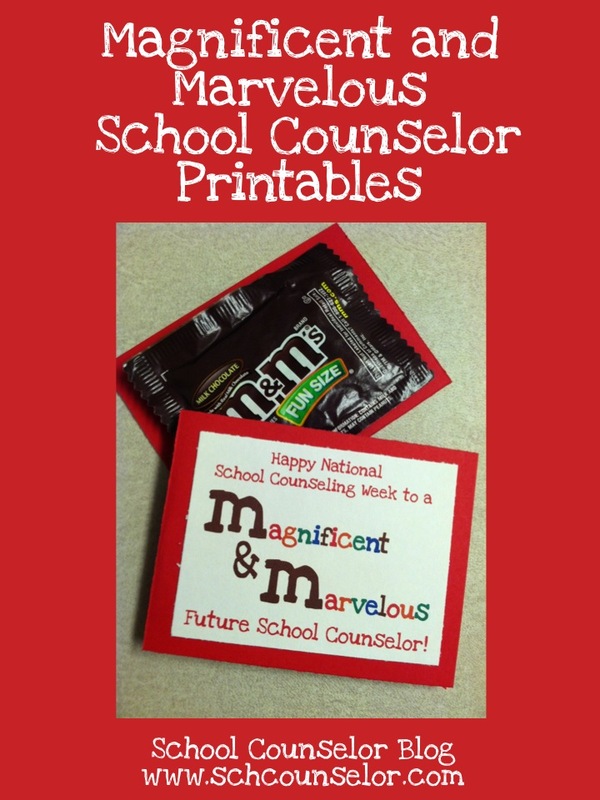 I also thought it would be fun to make one for school counselors in general that you could give to a school counselor colleague or school counselor supervisor to brighten their day. You could of course attach this printable to a larger bag of M&Ms too! 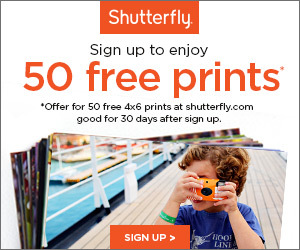 :) Click on the images below for a printable of your choosing! 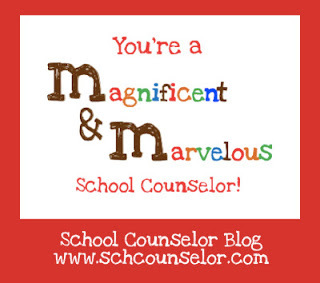 What other times of the year could you give a sweet M&M treat to a Magnificent and Marvelous school counselor you know? As a side note, I have been using PowerPoint to create all kinds of images containing words lately. It is a lot easier to navigate and move things around than in a word document. I am so excited that I was able to participate in School Counseling On Air! Although I have done a webinar before and presented many times at local, state, and national conferences, I have never participated in anything like a live on air hangout. It was such a fun and different experience. It was so cool to connect with people and participate in week of live professional development for school counselors! It is amazing to me how easy it is right now to share information with the world. I look forward to doing more live on air hangouts in the future! 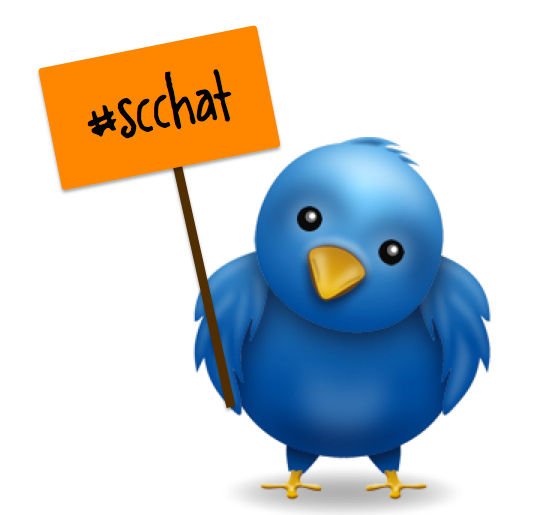 I would love for you to share topic ideas for hangouts you would like to see in the comment section of this post! I am planning to do a re-cap of each of the hangouts, but for now I wanted to give you a description of all the hangouts and the link to the archived YouTube videos! All of the videos are also available on the School Counseling On Air YouTube channel. Jeff Ream, the Counseling Geek, discusses digital stakeholder communication tools to hype up your program, including mailchimp and constant contact. Jeremy Goldman was also participated on air. Francine Sabens (@FSabens) moderated the February School Counselor Tweet Chat (#SCCHAT) on Using Data to Create Opportunities for Academic Success. Danielle Schultz (that's me!) and Andrea Burston shared tips and information about navigating graduate school and life as a new school counselor. 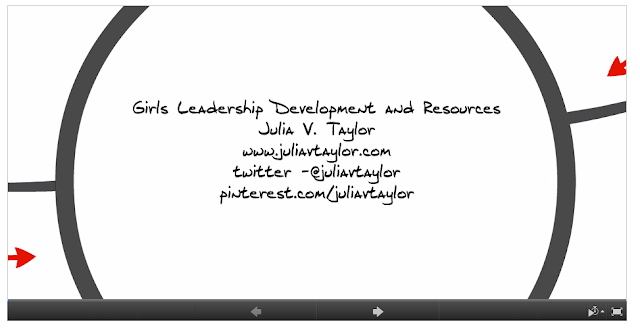 Julia V. Taylor discuss a variety of ways that school counselors can help girls develop critical leadership skills. Dr. Trish Hatch shares the whys and ways to measure, present and share School Counselor RESULTS! Dr. Erin Mason discussed how to integrate social media into our professional programs as school counselors. Daniele Schultz and Jeremy Goldman participated in the live hangout and shared ways they utilize social media. Jeremy Goldman showed numerous ways to use spreadsheets to improve one's efficiency and effectiveness in managing a school counseling program. 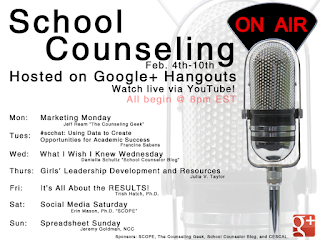 Again, all of the videos are also available on the School Counseling On Air YouTube channel. 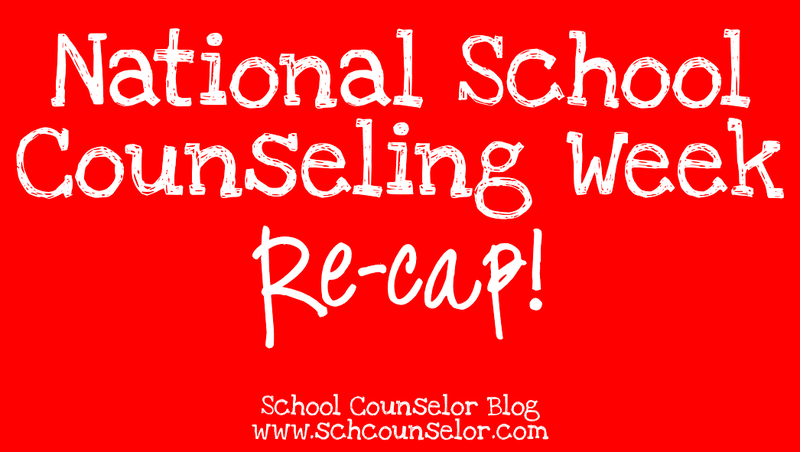 New Free Spirit Publishing Post: Ways for School Counselors to Celebrate National School Counseling Week! I have a new post on Free Spirit Publishing's Blog! 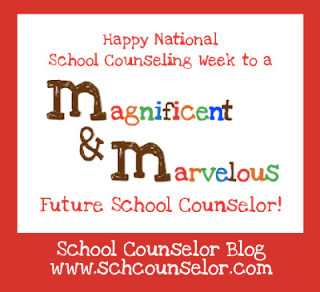 I can't believe it is National School Counseling Week already! If you haven't made plans on how to celebrate National School Counseling Week at your school, no worries! 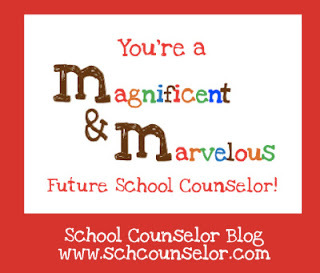 In my latest post Ways for School Counselors to Celebrate National School Counseling Week for Free Spirit Publishing's Blog, I share tips and ideas of how to celebrate National School Counseling week while advocating for your role as a school counselor! 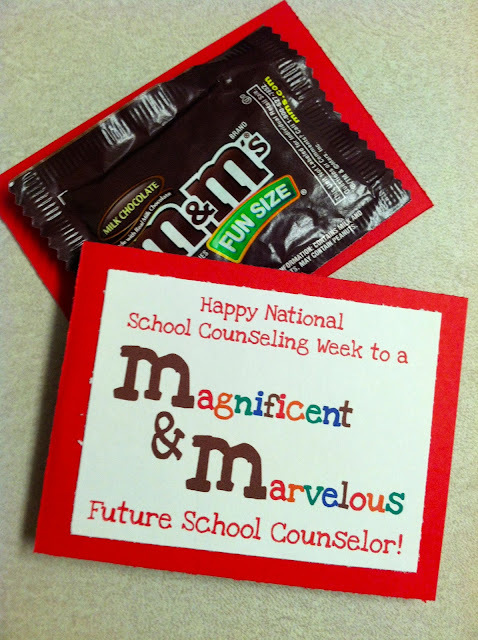 How are you celebrating National School Counseling Week at your school? 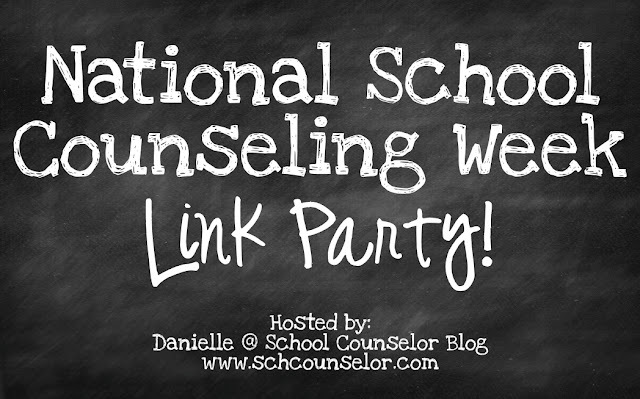 In celebration of National School Counseling Week I am hosting my first ever Link Party! 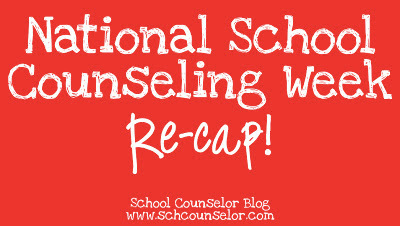 I know lots of school counselor bloggers out there have ideas, lessons, and resources to share related to National School Counseling week. What better way to celebrate and share together than a link party?! 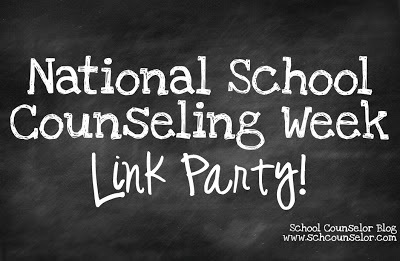 Everyone is invited to link up to celebrate National School Counseling Week!